How Do You Play Mystery Bonus Poker? Have you heard about this game that came into the market and actually managed to stay and become quite popular? Mystery Bonus Poker was born between the combination of video poker and slot machines. When you play it, you can use either a regular hand or a bonus hand. If you are new to the game, be warned about the contagious effect that this game has. At least that’s the effect it had on me and I’ve been its fan since day one. It is both interesting and intriguing and you can actually win money from it. If you have played it, then you know that I’m not exaggerating when I say that this game has both of the poker world and the slot machines world. You hit the Deal button and the bonus reel will appear. The actions and buttons available in this game are pretty much the standard ones, mainly Bet, Bet One, Bet Max, Draw Deal, Hold and Cash Out. After it completes its spin, five more cards are dealt to the player. The play lines will be increased based on the spin. The player can then go for the revealed bonus or just grab the best poker hand, using the rest of the pay table. Just like in all video poker games, this one also has its own payout table, and you can easily see how much you can win at all times. If you want to win big with Mystery Bonus video poker, pretty much like in other casino games, you will have to step up the ante and also risk big. Sometimes, the high risk will provide a great reward. In Mystery Bonus video poker, the player will win only if the final hand is at least a pair of jacks. If the final hand is not at least jacks, then you will lose the game and you will have to play again. 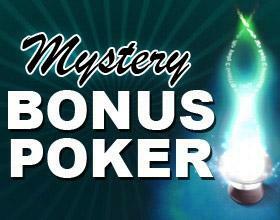 Mystery Bonus Poker has a special feature: It has a special payline that increases based on the Mystery Bonus Reel. Mystery Bonus Video Poker can be played in most if not all (RTG) casinos. If you ask me, I think that the magic of this kind of poker lies in the fact that the game brings a wonderful touch to the video poker machines; although, like always, playing more coins will increase the payouts on winning hands. It is quite a strange mix of games and players always love odd things and odd games. However, when you play the game, remember not to go blind, as you must have some kind of strategy just like you do with poker. My advice would be to play with virtual money and, once you get the hang of it, start playing with real money. You are now ready to hit the mystery machines. Don’t make them wait. They’re ready for you!